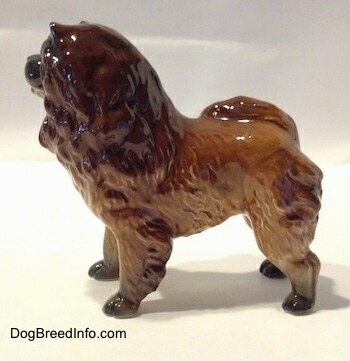 Pictured is a 1950s Chow Chow by Goebel. 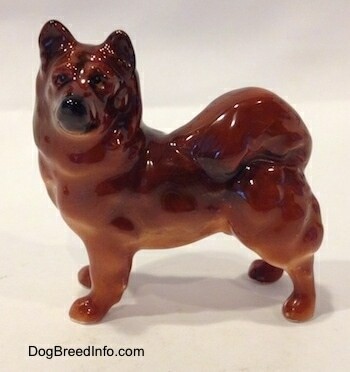 It is of a brown and tan dog with a black tongue and snoot. The eyes, inside the ears and the toe nails are black. 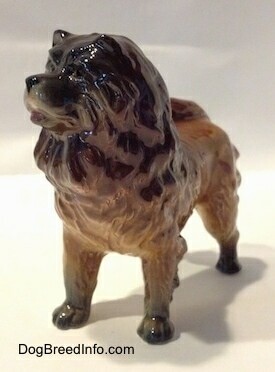 It is lighter in color than the two 1970s Goebel Chows that I own. 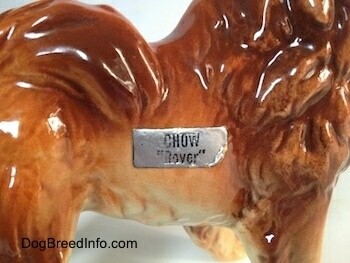 On the side of the dog is an original sticker that reads Chow Rover. 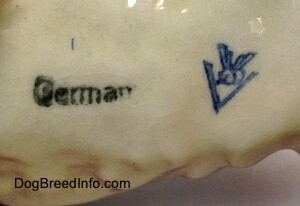 On the bottom is the trademark 2 (TMK-2) Goebel logo of the bee inside the V. There is also a black stamp that reads Germany. 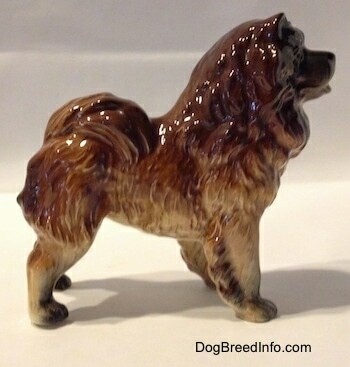 It is 4 3/8 inches tall from the ground to the top of the head, 4 3/4 inches long from the tip of the nose to the back of the legs and 2 inches wide. 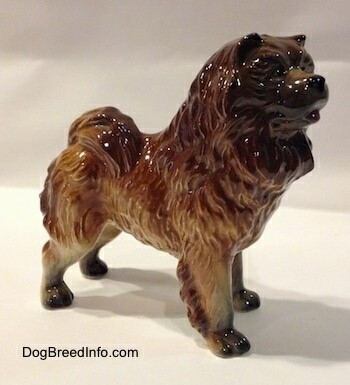 1950s Chow Chow by Goebel with Chow Rover sticker—image showing the trademark 2 (TMK-2) Goebel logo of the bee inside the V and the black stamp that reads Germany. 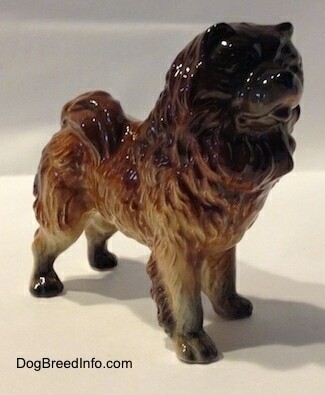 Unlike the Chow Chow below who had his two front legs broken off and re-glued, this guy is in mint condition. 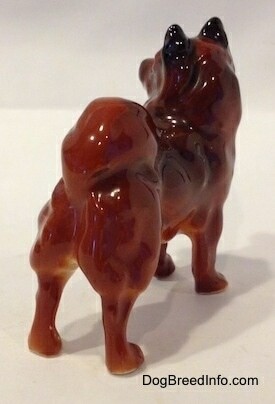 This is a vintage 1970s Goebel figurine from West Germany. 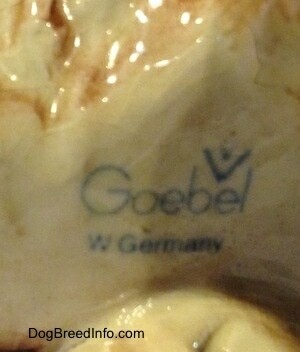 On the bottom is the trademark 5 (TMK-5) Goebel logo of the bee inside the V above the 'bel' in the name Goebel. Below that it reads W. Germany. The stamp was placed on the belly and partly up onto the front left leg, therefore the bee and V are both looking a little funny, but they are there. 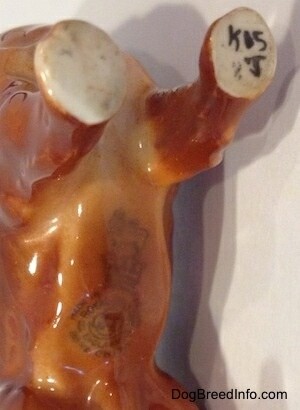 On the front right paw is a number engraving that reads 63. 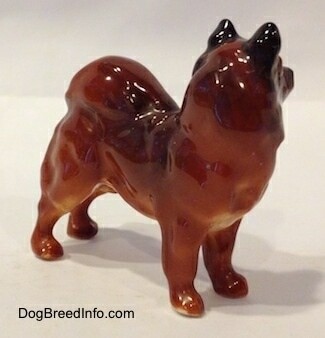 It is 4 1/4 inches tall from the ground to the top of the head, 4 1/2 inches long from the tip of the nose to the back of the legs and 2 inches wide. 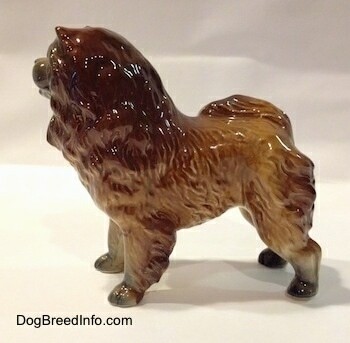 1970s Goebel Chow Chow dog from West Germany—image showing the trademark 5 (TMK-5) Goebel logo of the bee inside the V above the 'bel' in the name Goebel. Below that it reads W. Germany. Notice how the bee and the V are a bit misplaced due to the curve of the leg. 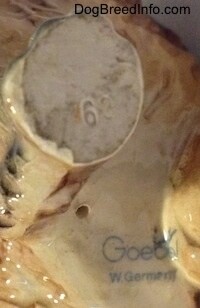 Engraved into the front right foot is the number 63. 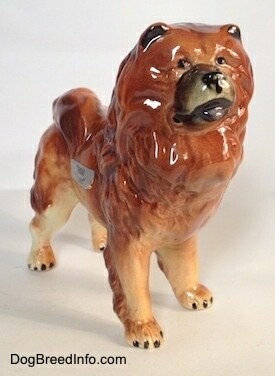 This is a vintage Goebel West Germany porcelain Chow Chow dog. Judging by the Goebel symbol on the bottom this piece was made between 1972 and 1978. 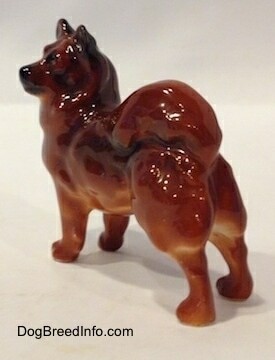 It has 63 engraved into the bottom of its front right paw. 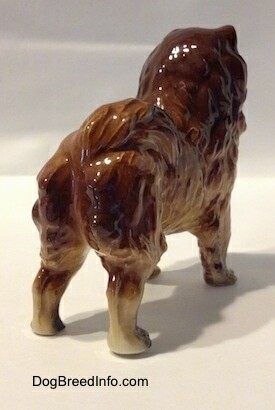 Very detailed with a nice deep glossy finish. It is 4 1/4 inches tall from the ground to the top of the head, 4 1/2 inches long from the tip of the nose to the back of the legs and 2 inches wide. 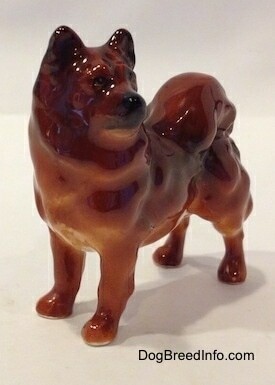 This poor Chow had his two front legs broken off and repaired. If you look closely you can see the crack lines. 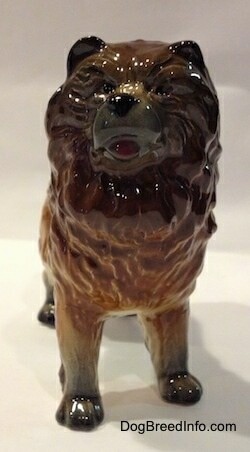 Vintage Goebel West Germany porcelain Chow Chow dog made in the 1970s—this picture shows the Goebel symbol. 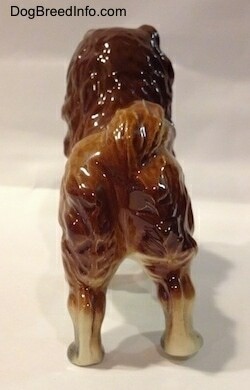 The way it is printed is an indication of the year the figurine was made. The layout of this Goebel print with the tiny bee inside the V above the 'bel' in Goebel and the W. Germany below it means it was made between 1972 and 1978 (TMK-5). 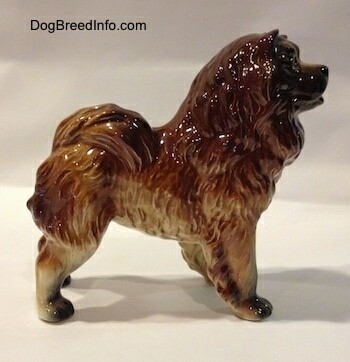 Vintage Royal Doulton Chow Chow dog i figurine in a standing pose—image showing the Royal Doulton logo stamped in green and K15 J inscribed on the front left paw. 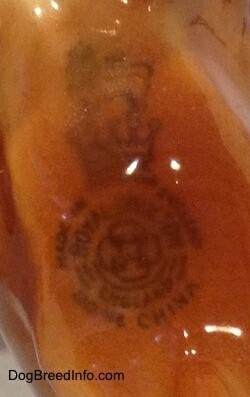 The stamp is of a lion on top of a crown. 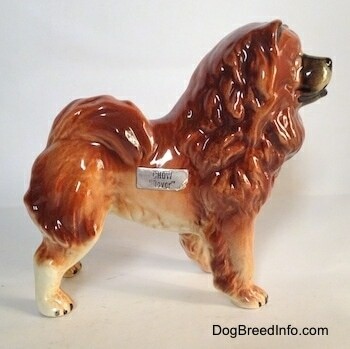 Below the crown it reads Made in England, Royal Doulton, England, Bone China. 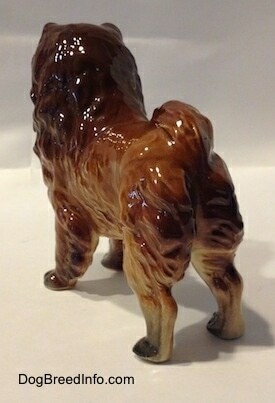 Vintage Royal Doulton Chow Chow dog figurine in a standing pose—image showing a close-up of the Royal Doulton logo stamped in green of a lion on top of a crown. Below the crown it reads Made in England, Royal Doulton, England, Bone China.